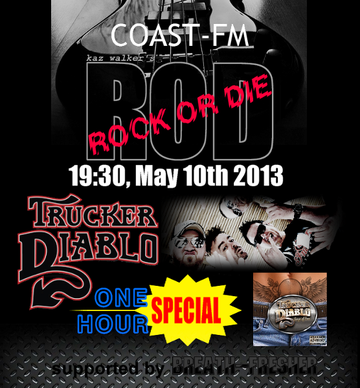 We BREATH-FRESHER support a radio program "TRUCKER DIABLO 1-Hour Special" on ROCK OR DIE of COAST-FM at 19:30 on Friday May 10th 2013. Their new album "Songs Of Iron" which will out on May 14th, will be featured, and also the comment from Tom Harte (Vocals) will stream on the show. Tune in on ROCK OR DIE! Now it can be heard on podcast below. Check it out!